Photojojo, a photography news sites and online stores have issued a newproduct that is 3 camera lenses are made specifically for the cellphone cameras and camera tablets. Previously we only know that the ability of the camera on the cellphone is always limited to the ability of the camera application software to simulate the ability of the camera lens. 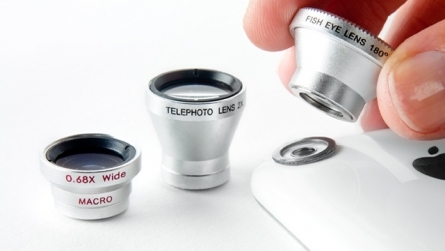 The lenses are issued by Photojojo is 2x telephoto lens, fish eye lens 180 degrees, and 0.68x wide angle lens that can function as a macro lens. All three lens is made ​​of glass that uses a high-level innovative mount, which is a metal ring around the camera lens glued to your cellphone. All three lenses can be attached with a metal ring that uses a magnet on the sides.